President Truong Tan Sang held talks with his Tanzanian counterpart John Magufuli within the framework of his State visit to the East African country on March 9. Tanzanian President John Magufuli (R) welcomes President Truong Tan Sang. Both leaders showed their belief that the visit will be a new important milestone, creating a driving force to develop the two countries’ traditional friendship and cooperation for development intensively and effectively. They said they were satisfied with positive progresses in Vietnam-Tanzania relations since the two nations established their diplomatic ties on February 14, 1965. 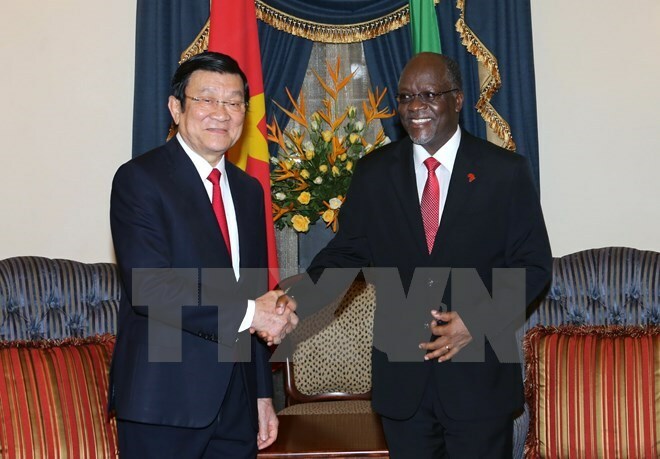 President Truong Tan Sang affirmed that Vietnam continually treasures and wishes to expand its mutual beneficial cooperation with African nations, especially Tanzania which has supported Vietnam during its past struggle for liberation and current nation building and development. He congratulated Tanzania on the achievements in its economic development and reform, while appreciating the country’s contributions to peace, stability and connectivity in the Southern African Development Community, the East African Community and the entire continent. The Presidents agreed to enhance bilateral political ties through delegation exchanges, intensifying coordination and support at the United Nations, the Non-Aligned Movement and other international forums. They shared opinions on regional and international situations and shared common principles to address disputes and differences in order to ensure peace and stability in regions and the world. Both agreed that territorial disputes and conflicts must be settled by peaceful means on the basis of international law. In terms of trade, the two sides discussed numerous measures to promote bilateral trade in conformity with their countries’ potential. Along with their strengths, like Tanzania’s cashew nuts and Vietnam’s rice, they agreed to expand import and export in garments and in agricultural machines. Vietnam is willing to act as a bridge for Tanzania’s goods to approach the markets of ASEAN and members of free trade agreements to which Vietnam is a member, President Sang said, hoping that Tanzania will create favourable conditions for Vietnamese commodities to enter Tanzania, other East African countries and the Southern African Development Community, towards a target of 1 billion USD in two-way trade by 2020. The two leaders also expressed their delight at the initial success of the Halotel telecoms network of the Viettel Tanzania joint venture, which has contributed to developing telecommunications, creating jobs for Tanzanians, and developing Tanzania’s economic regions. President John Magufuli said he hopes other Vietnamese enterprises will invest in or share experience and technologies with Tanzania in the fields of agriculture, aquaculture, garment and textiles, and footwear, and invest in Tanzania’s industrial zones. The two leaders agreed to make agriculture and telecoms the two priorities in bilateral cooperation in the time ahead. They were unanimous in implementing two agricultural cooperation projects in Tanzania, and in the early organising of a second meeting of the Vietnam-Tanzania Joint Committee in Dar-es-Salaam, within the year. They vowed to encourage the two countries’ localities to cooperate directly – like between Tanzania’s Zanzibar and Vietnam’s Quang Ninh province. They also reached a consensus on speeding up the signing of an agreement on avoidance of double taxation and another on investment encouragement and protection. President Sang took the occasion to invite his Tanzanian counterpart to visit Vietnam. The latter accepted the invitation. The date of the visit will be reached through the diplomatic channel. 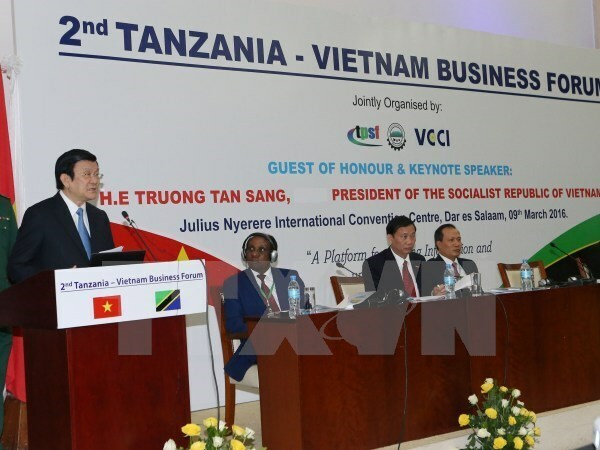 President Truong Tan Sang and Tanzanian Prime Minister Kassim Majaliwa attended a business forum between Vietnamese and Tanzanian enterprises in Dar Es Salaam city on March 9. The President is on a State visit to Tanzania at the invitation of his Tanzanian counterpart John Magufuli. Tanzanian businesses expressed their wish to expand the cooperation with Vietnam to the potential field of telecommunications besides the existing ties in agriculture, noting that the Tanzanian Government is striving to build a safe and friendly investment environment. They said through the year’s forum, Tanzania wants to elevate trade with Vietnam which remains modest at 100 million USD in 2010 and 105 million USD in 2013. The two countries’ business associations have signed a Memorandum of Understanding on increasing delegation exchanges, promoting trade and seeking investment. Prime Minister Kassim Majaliwa said Tanzania could serve as a gateway to help Vietnamese businesses make inroads into the 300-million strong market in East Africa. As one of the most attractive investment destinations in Africa, Tanzania drew a 700-million-USD investment project from the Vietnamese military-run telecom Viettel, he noted. The country has passed a number of investment laws to ensure rights and interests of foreign investors, he said. The Government leader revealed that his country is prioritising infrastructure, nutrition industry, ore sifting, seafood processing, and tourism projects and hopes Vietnam will pay more attention to these fields. Particularly, Tanzania is targeting a power growth of 5-8 percent, so it welcomes overseas energy investors, including those from Vietnam, to this sector, he said. For his part, President Truong Tan Sang said Vietnam’s development policy encourages cooperation with Tanzania and other African countries. He informed the business circles about the outcomes of his talks with Tanzanian counterpart John Magufuli, saying the two nations recognised the significance of increasing economic collaboration. He described the launch of Viettel’s telecom services under the brand name Halotel in Tanzania as an initial success, which will open up new cooperation prospects in the coming time. Vietnam has strength in agriculture and is willing to help Tanzania implement the national food security programme, he said, adding that Vietnam is importing cashew nut and cotton from Tanzania, and is eyeing other strategic products of the African country. He confirmed that Vietnam will create all possible conditions for Tanzanian businesses to seek investment opportunities in the Southeast Asian country. The President urged the business circles to recommend to the two governments policies facilitating business ties.